(Newser) – President Obama's pick to be the next attorney general has wrapped up a daylong confirmation hearing on Capitol Hill, and the AP writes that Loretta Lynch's day can be summed up in one question posed to her by Republican Sen. John Cornyn. “You’re not Eric Holder, are you?” Cornyn asked her in jest. 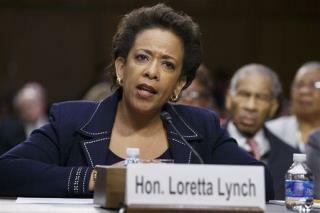 Lynch assured him she wasn't, adding later that, as attorney general, “I will be myself. I will be Loretta Lynch. And I will refer you to my record [as U.S. attorney] as well as a practicing lawyer to see the independence that I have always brought to every particular matter.” Generating the most headlines today was her defense of President Obama's controversial policy to ease deportation rules for millions of undocumented immigrants. Death penalty: She backs it as an "effective penalty." Waterboarding: It is "torture and thus illegal." NSA surveillance: The programs were "constitutional and effective." Marijuana: It “certainly would be my policy" to continue enforcing marijuana laws at the federal level. She is definitely a gifted politician. Also the typical Harvard Ivy League History! The bottom line is. She would not have been picked if she disagreed with any of the presidents agenda. We have had a few others that did. They did not last to long. So I expect more of the same! It is good that Obama is bringing in a person who understand racism and that blacks are not guilty of the charges against them. "You're Not Eric Holder, Are You?" "Silly question! I'm an Eric Holder impersonator."